Well, this was a mistake. 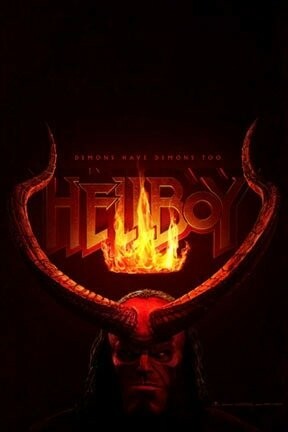 Eleven years after Guillermo del Toro’s second and final Hellboy movie comes this exhausted, exhausting reboot that's drenched with pointless, joyless gore and scabbed over with dumb exposition and dumber jokes. Stranger Things’ David Harbour, taking over Hellboy's horns from Ron Perlman, does his best to liven things up, but he’s foiled by an overcrowded, confused script (a baby that's secretly a pig man? Sure! A Leni Riefenstahl cameo? Uh...) and a supporting cast that's uniformly terrible. (Ian McShane is unexpectedly lousy; Milla Jovovich is her usual level of lousy.) Sloppy, frantic editing and uninspired direction from Neil Marshall—who's a loooong way from his solid work on Dog Soldiers, The Descent, Doomsday, and Game of Thrones—make this thing feel about 20 hours long, and it's one of those movies that clearly cost a bunch of money to make but still looks cheap.